Who Decides: Man or Machine? General George Patton: "Wars may be fought with weapons but they are won by men." 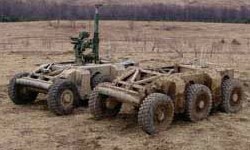 Robots in Iraq and Afghanistan are showing utility. But it is unlikely that any robotic or artificial intelligence could ever replicate the ability of a trained fighting man in combat. A machine cannot sense something is wrong and take action when no orders have been given. It doesn't have intuition. It cannot operate within the commander's intent outside its programming. It doesn't have compassion and cannot extend mercy. The idea that robots can do our fighting masks the realities of war: unpredictability, violence, destruction, misery, suffering, and death. Future Combat Systems (FCS) will include the use of improved fighting vehicles and a significant increase in firepower, situational awareness and precision engagements. 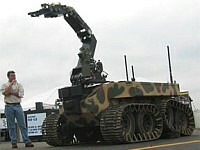 It will also include several variants of robots, some of which are designed to engage enemy forces in direct combat. But we must pay more attention to the actions and abilities of our future opponents and their ability to overcome the initial advantage we would gain through the use of robotics. We must accord the human dimension at least an equal share of our focus. The ability of the combat soldier and his leader will remain the decisive factor in all future war.